Replace the traditional calorie-rich Mexican tortillas with these simple, easy-to-make healthy, homemade tortillas. Made with whole wheat and maize flour, these fiber-rich tortillas help you curb hunger effectively. 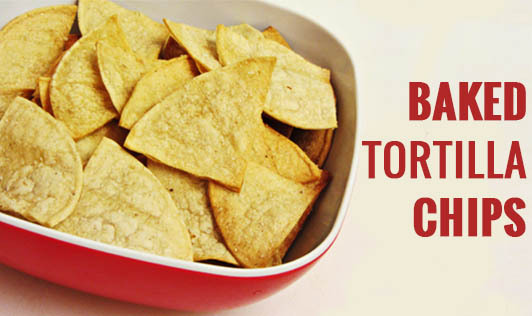 Have these healthy chips with a fresh tangy tomato salsa and enjoy the lively salsa flavors. You can also make them in bulk and store them in an air-tight container and serve them as starters to your guests. 1. Mix all the ingredients in a bowl and knead into soft dough using enough hot water. 2. Divide the dough into 6 equal parts. 3. Keep a part of the dough between 2 plastic sheets, dust a little flour and roll into a thin 7 diameter round tortilla. 4. Dust the tortillas with a little more maida to prevent them from sticking to each other. 5. Now lightly cook the round tortillas on a non-stick pan, and then cut them into triangles. 6. Place butter paper on your baking tray and arrange the tortilla triangles on it. 7. Bake the tortillas at 190°C for 8 to 10 minutes or until they are crisp, and slightly browned. 8. Cool and store them in an airtight container.